The DEP 2001 dosing machine offers a great many production possibilities and a choice of product shape. The specific regulations of the operative functions are managed by a fast microprocessor control system which allows preset programs to be stored in memory. An easy-to-use control panel shows the various working parameters on a luminous liquid crystal display. Previously stored programs may be loaded at any time by means of the control panel. Once loaded, the individual parameters may be varied for a single production run, or saved as a new program. The DEP 2001 has an anticorodal aluminum structure, coated externally with stainless steel to allow fast and easy cleaning. The four swivel wheels, fitted on all models, allow them to be moved about conveniently. The dosing units, with rollers or with a pump, the moulds with rotating nozzles, and the wire-cutting device make its use extremely versatile and creative in the production of biscuits and pastries. The unit with the roller head presses and pours stiff doughs. The stainless steel rollers, provided with suitable grooves, press the dough through the nozzles on the mould, thus forming a wide variety of different shapes, with excellent uniformity of size and weight. The adapters for soft doughs, suitably fitted inside the hopper, allow whipped or partially creamy mixes to be processed with the same dosing unit. 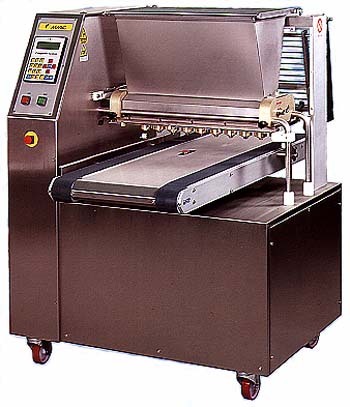 The special features of the wire cutting system allow the processing of harder doughs. The rollers press the dough through plates fitted with a special mould, after which a small frame with a steel wire cuts it to the desired thickness. The unit with a gear pump is complimentary to and interchangeable with the roller unit. The outward rotation of the toothed rollers causes the dough to be sucked up gently from the hopper. The dough is then passed through the nozzles without altering its structure, thus ensuring products that are light and fully developed.